Incoming from our friends at Ogilvy Cape Town: an update on Percy Bartley House – the Woodstock home for boys in need – which we covered last September. Having found refuge at Percy Bartley House, a Woodstock home for boys in need, these youngsters are now gaining renewed inspiration for life through art; a medium that has not only transformed their home, but most recently their lives too. Supported by two Woodstock-based companies committed to using their creative resources to uplift the area – Ogilvy Cape Town and Write on Africa – the boys have been attending weekly art classes this year where they have been learning not only different artistic styles and techniques, but valuable life skills too. “We have been supporting Percy Bartley House since we moved into the community in 2006. Following the rejuvenation last in 2010, this year the focus has been on helping the boys develop their own creative skills as well as a healthy form of self expression,” says Gavin Levinsohn, Managing Director of Ogilvy Cape Town. Further encouragement for the youths has also been found in their teachers, Mkwela Juma and Willard Kambeva, who have both triumphed over hardship. Both Zimbabwean born, the two suffered years of difficulties in South Africa as a result of the 2008 xenophobic attacks and met at a place of safety where they were appointed the group’s leaders. It was there that they made a decision to make change happen and have since been working together, using art to bring about social development in various disadvantaged areas. 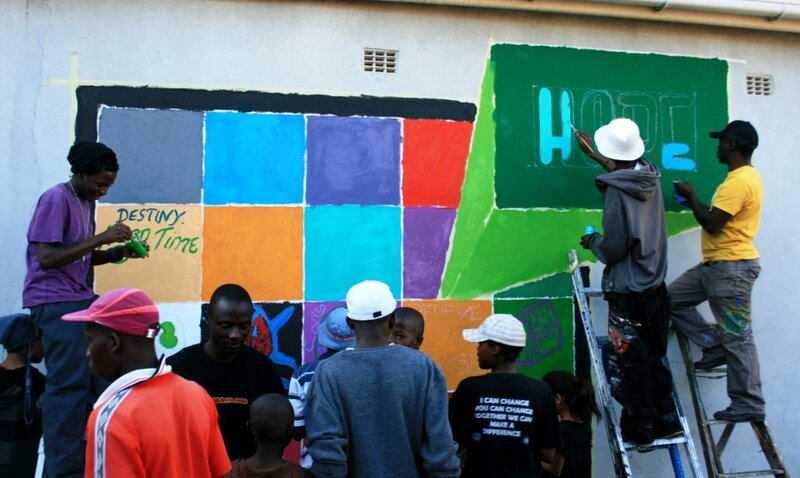 Bartley House paint a mural outside their home which defines what hope means to each of them. “In working with Percy Bartley House, we have encouraged the boys to believe in themselves. Whether it is teaching them a new painting technique or how to draw, they can now express any idea or thought through art,” adds Kambeva. This feeling is echoed by the budding artists, who comment: “We are learning a lot in the art classes, from mixing colours to working together as a team.” Adds another: “Art keeps me away from bad friends and off the street. It gives me peace in my soul!” Most importantly, the boys gain encouragement in expressing themselves through their artwork and aim to relay meaning in each piece they produce. Ogilvy Cape Town sees the support of the home, as well as the ongoing upliftment of the Woodstock community as a key part of its creative contribution and, as part of the long-term plan, it will be assisting in the rebuilding a burnt down section of the home. The new section will create a larger space to welcome more youths in need, with the walls acting as creative canvases for reflecting their dreams and ambitions. You can get more information about Ogilvy Cape Town’s awesome work with Percy Bartley House from Victoria Tatham on (021) 467 1174. As you may know, I work at Ogilvy and over the past 6 months have been trying to get this amazing project approved and moving and finally its happening and I need your help. When we moved into Woodstock a few years ago we wanted to help uplift the area and therefore adopted Percy Bartley House as our un-official charity. PBH is an NGO operating out of an old home in the area which looks after troubled teen boys – those involved in petty crime or living on the streets – and aims to not only provide a home for the boys but to give them a second chance; whether that’s enrolling them in school or skills training, or teaching them life skills. PBH is run-down and has lost its sense of life and colour. We’ve therefore collaborated with Write-on-Africa – a not for profit initiative also based in Woodstock, that mobilizes creativity in Africa for inspiration, social change and urban rejuvenation. We’re giving the home a new coat of paint, we’re planting a sustainable garden and we’re providing them with donations of linen, towels and furniture from our clients. However, most importantly, we’ve brought on a crew of well-known graffiti artists and illustrators (Faith47, black koki, mac1) to breathe new life into the home, making it a work of art which inspires the youth, while also getting them involved in the process and teaching them responsibility. This after I saw this video yesterday featuring some of the kids they are helping and Farlane Nsinale – the Director and “Mom” of the house. It’s a great advert for the work they are doing there and the opportunities PBH is providing street kids who would otherwise be in a lot of trouble. It’s also evident that, like Farlane, Amy is extremely passionate about making a difference and it’s for these reasons that I am more than happy to help her – and them – out. I have initiated a fundraiser – selling tickets to a movie – Long Street – set in Cape Town, directed by well-known SA director, Revel Fox and starring his daughter – Sannie Fox – you may know her as lead singer from Machineri. I booked out a cinema at the Labia on Orange for opening night on Thurs Sept 23rd at 20h00 – 20h30. Anyone who wants tickets (R50 each) just needs to email me here – I have 60 tickets left to sell. That would be your safest option, but if you’re feeling lucky, we have 2 pairs of tickets for the opening night of Long Street to give away. To stand a chance of winning a pair of tickets, firstly make sure you are able to make it along (i.e. you will be in Cape Town and not doing anything else that evening) and then simply tweet this: “#PercyBartleyHouse http://u3.co.za/id”. The winners will be drawn at random from entries at 21:00 on Monday evening, giving you enough time to plan your week accordingly. Judges decision is final etc etc. I’m not expecting this to be quite as big as the #AfrihostRelaunch thing. But I think that’s for the best, don’t you? And well done to Amy and all those involved in making a difference at PBH.